I wrote in January about the “unanswerable case” for a referendum on the Withdrawal Agreement (it is not a second referendum but nor is it a referendum on the final deal), and I have not changed my mind in the slightest. To say such a referendum would not be democratic is self-contradictory. I personally would be happy for parliament alone to call a halt to Brexit, but if MPs believe that to do so would be seen as undemocratic then we have to have a referendum on the Withdrawal Agreement (WA). Does it bother me that this will not be a referendum on the final deal, because the WA is likely to be vague on the final trade arrangement? No, for two reasons. First a referendum on the final deal will be meaningless because we will have already left (something which I do think is undemocratic). Second, we now have a huge amount of information compared to 2016. We now know that there are essentially two types of deal with the EU we can do. The first is some kind of FTA (free trade agreement), where Northern Ireland would stay in the Single Market for goods and Customs Union (the Irish backstop). Theresa May says that is something no Prime Minister could agree to, but more worrying from my point of view is that we would be a lot poorer as a result because we would do less trade with the EU and many of the third countries that currently have trade agreements with the EU. Those who tell you that getting our own trade deals with those third countries would be a piece of cake are the same people who told you that we held all the cards with the EU. The second option is that we stay in the Single Market and Customs Union, but have little say in how those emerge. That avoids the need to implement the Irish backstop, which is why it will be the most likely option that May will agree to in the end. The economic hit from that would be much smaller than the first option, but we end up with substantially less sovereignty than if we stayed in. May would like to persuade the EU to leave open the idea of extending the backstop to the whole of the UK, meaning we stay in the CU and SM for goods only, but I think the chances of the EU agreeing to this at the end of the day are slim, and as geography is as important to services as goods we would be worse off as a result. This choice was not clear to even experts at the time of the referendum, and it was certainly not clear to voters. The campaign hardly mentioned Ireland (and when it did, it did not imagine a backstop), and voters were told there would be more money for the NHS (there will be less), Turkey was about to join (it is not), EU immigration hurt the public finances (it does the opposite), we held all the cards in any negotiation etc. The Remain side may have exaggerated the immediate economic hit, but two years later GDP is around 2% lower as a result of the uncertainty created by Brexit and the fall in Sterling has in addition cost each household an average of £400 per year. That is fact not Project Fear. So the case for a referendum on the WA is overwhelming, given all the extra information we have. That nearly all this information has been negative for Brexit is reflected in the polls. So what should the referendum question be? I do not think No Deal should be an option. No one seriously campaigned for No Deal in the first referendum, and only a minority of Conservative MPs (60?) support it. The obvious question to ask is do you want to accept the WA negotiated or do you want to Remain in the EU. This does not disrespect the original referendum vote any more than the 2017 general election disrespected the 2015 one. John McDonnell on the Today programme yesterday (here, 2:10 hours in) seemed to suggest a question like do you accept the WA, yes or no? Some took the 'no' as implying No Deal, but I doubt that as Labour would be campaigning for no and have already said No Deal is not an option. Instead it would be a suggestion to reopen negotiations. But if Labour cannot force a General Election, and with May saying this is the best deal she can get, what is the point? If you think a no result would put pressure on the EU, see what happened after the Greek referendum in 2015. I think many voters would realise this, and just vote for the WA to speed the end of the paralysis in government that Brexit had created. Not only does his suggestion make little sense, but it was politically disastrous, given the overwhelming support for a referendum that included the Remain option among Labour voters and members. Just after a composite motion had been agreed which is itself a compromise between Remain members and the leadership, he appears to undercut it at a stroke. The words he should have said came from Starmer later in the day. So the referendum on the WA should be a simple choice between accepting the WA as negotiated or cancelling Article 50 and remaining in the EU. What about all those working class Labour voters in the towns of England and Wales who will feel betrayed if we stay in the EU? Those people were sold snake-oil, and you do not expose snake-oil by prescribing it on the NHS. Instead you make sure you enact policies that reduce the demand for snake-oil, and hopefully that is what a future Labour government will do. One reason Brexiters split in stage one of the Brexit endgame is that there is no good way forward for them. When Boris Johnson calls the EU’s Irish border backstop “a monstrosity” he is talking about its impact on the plans of the Brexiters rather than its impact on the UK. It destroys their hope of a Canada type Free Trade Deal with the EU, because the EU will not agree to anything like that without the backstop, but the Conservative and Unionist party cannot agree to a backstop that ends the UK single market. 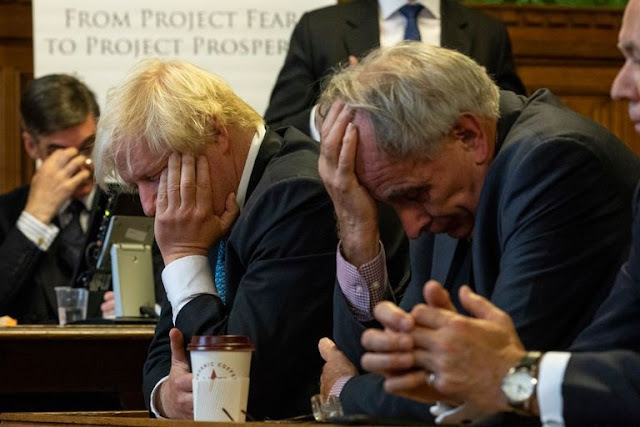 Those that split over Chequers (the quitters) have one hope left, which is we crash out with No Deal. Those that did not, like Gove and Javid (the schemers), hope that one of their number can at some stage grab the party leadership and then change any agreement to their liking. But neither strategy is likely to work because of that ‘monstrous backstop’ and parliament’s ability to stop No Deal. One way No Deal could happen is that May fails to compromise enough to get a Withdrawal Agreement (WA). If nothing else then happens, we get a catastrophic No Deal. But if she cannot make a deal with the EU she has to report to parliament on 21st January (ht Steve Lawrence). Parliament can then vote down this ‘neutral’ motion, and perhaps amend it if the speaker allows. But I suspect this is a bit academic, because what parliament is likely to request is what May herself would want, which is an extension of Article 50 (A50). The EU does not want No Deal anymore than May does. So they are likely to agree to that request, but probably at some political price. The whole point of A50 is that all the power lies with the EU. What that price will be I do not know, but in any iteration between the EU and parliament I cannot see a No Deal outcome unless either party seriously miscalculates. This is not a sequence of events that looks good for May, which is one of the reasons why May is likely to conclude a deal. In that eventually (there is a WA) the quitters will hope that they can defeat the deal in parliament. How many of the quitters will stay firm in that resolve is unclear, because the outcome of the deal being defeated is unlikely to be No Deal. Quitters apart, MPs want No Deal even less than they want whatever WA May puts to them. In the political chaos that results something like a referendum or a general election may emerge as a way forward (and the EU will extend A50 to allow time for this). Brexiters do not want a referendum, because for all their talk of the will of the people they only want that will if it agrees with their own wishes. Given all this, the schemers may seem to be on firmer ground. Let the WA pass, and then change anything that is agreed subsequently once one of their number becomes Prime Minister. Note in passing that the Brexiters and May have a common interest in what I have called a perpetual Brexit: the Brexiters because it keeps the issue in members minds when they come to vote for May’s replacement, and for May because for that very reason the majority of Conservative MPs who are not Brexiters will want her to stay. The problem for the schemers is that after the WA they face exactly the same problem Brexiters face now but more so. The Irish backstop will now be enshrined in a treaty. Any attempt to reduce the degree of alignment of regulations between the UK and EU, for example, would end the UK’s single market. Enough Conservative MPs will object to that and so prevent it happening. The big flaw in the Brexiters’ plans to free ourselves of pesky EU regulations on employment, the environment etc is the Good Friday Agreement, the laudable wish of the Irish government to keep the spirit of that agreement intact, and the admirable wish of the EU to stand by one of its members. If that had not been the case, they might have got away with a FTA with the EU, but instead they are stuck with the ‘monstrous’ backstop. In the end the Brexiters have failed because they are just not very good at what they see as details. The critical detail in this case is the large island to the west of Great Britain. The Brexiters may have failed in their primary aim, but they have caused considerable damage nevertheless. Estimates of the GDP loss so far are around 2%, and real wages have fallen by a lot more than that because of the depreciation. Unless MPs can, directly or indirectly, stop Brexit, we will end up at best with less sovereignty than we had as members of the EU. The damage to the UK's reputation, both as a safe place to export from and more generally as a pragmatic tolerant nation, will take a very long time to repair, and that time will not start until the Brexiters themselves lose their political influence. According the current data vintage, GDP was already falling at that point, yet interest rates were not reduced by enough to prevent a recession because of concerns about pressure on sterling. GDP continued to fall almost continuously until we were forced out of the ERM (Black Wednesday). Leaving the ERM allowed interest rates to be lower and produced a 10% depreciation in sterling, which helped ensure a strong recovery. I’m sure I wasn’t alone in making this prediction, but we were in a minority and we did produce the best analysis. The Global Financial Crisis (GFC) was of course a much bigger event, and far fewer saw it coming, so quite rightly 10 years later those economists who predicted something like it are getting media attention. They were very different events, so can we draw any parallels between them, or more generally is there anything that links disasters of this kind? One common factor is using the markets as an excuse to avoid economic analysis. One of the two main excuses to ignore our ERM analysis was to look at the exchange rate at the time as say ‘the market must know what it is doing’.Of course before the crisis too many people who saw the data thought the banks must know what they are doing as they pumped up leverage. Perhaps another is never let new ideas crowd out the knowledge embodied in older ideas. The other excuse that particularly academics used to disregard our analysis about the ERM entry rate was that the models we were using were a little old fashioned. (I talk more about that here.) Bankers fooled themselves that they had new methods of evaluating risk that meant they could ignore systemic risks. If we think of the other two major UK macroeconomic crises, the same applies. The Treasury predicted the recession of 1980 pretty well, but the analysis was trashed as the work of old fashioned Keynesians by Lawson et al from the Thatcher government. Austerity of course also ignored basic Keynesian truths. One obvious final question is whether we learn from crises of this kind. Ten years after we left the ERM the Treasury asked me to do their entry rate analysis for possibly joining the Euro, so that at least implies some learning, but maybe being a different government helped. Perhaps Black Wednesday created a general distrust of fixed exchange rate regimes in the UK that helped Gordon Brown argue against joining the Euro. Have we learnt the lessons of the GFC? Some changes to the banking system have been made, but I think the general consensus is its is not enough, and there still seems to exist a large implicit public subsidy for the major banks. If for no other reason that is why you should take note of what those who predicted the GFC say. In terms of how you recover from a financial crisis we certainly had learnt some of the lessons of the 1930s, but not all. As I argue in my last post, we have hardly begun the process of creating a macroeconomic policy regime that can deal with a future recession, let alone a crisis. It is also obvious that the ECB were wrong to raise rates in 2011 and not to introduce QE much earlier. That the UK almost raised rates in 2011 is not reassuring, and suggests they did take their foot off the peddle over that period. I would also argue that the ECB were very wrong to wait until September 2012 to introduce OMT. In the UK and US I do not buy the argument that no further stimulus was needed. UK unemployment rose from around 5% to around 8% in 2008/9, and stayed at that level until it began coming down in 2013. 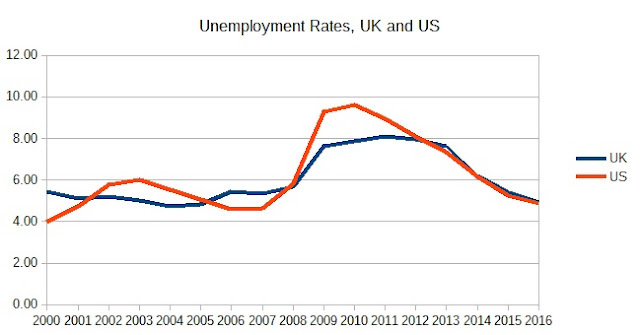 US unemployment was also above 8% until 2013. Both economies needed more stimulus in 2009, and in its absence in 2010 and so on. To think otherwise means you are placing too high a weight on temporary changes in inflation and too low a weight on the costs of the recession. Where I think I might disagree with Martin is that this stimulus could have reliably come from monetary policy. A good policy instrument is one that has a reliable impact on demand, and the only reliable monetary policy instrument that fulfills that criteria is short interest rates. Central banks could have done more QE, or they could have reduced rates below the Effective Lower Bound (ELB), but they wouldn’t have known how much to do. They might have got there in the end, but extra years of unemployment and probably a permanent hit to output through hysteresis were an avoidable cost. The biggest mistake central banks made was not to recognise this and be honest with the public. They should have said, clearly and repeatedly, that once rates hit the ELB monetary policy was no longer the most reliable instrument to stabilise the economy, and fiscal policy should be used. This does not break any implicit concordat about not commenting on fiscal policy (which most central banks break anyway), because the statement is about a delegated authority being honest with the public about whether it can reliably do its job.. The fact that central banks in the UK and Eurozone didn’t do that may reflect dishonesty or it may reflect negligent ignorance. The fact that options like QE existed may have allowed central banks to convince themselves that they could still do the job assigned to them, and it discouraged them from being honest with the public. I say negligent ignorance, because instrument reliability is pretty basic stuff. This is what I call the Consensus Assignment, and as the name implies it was certainly the consensus among mainstream macroeconomists before the 1990s. But the experience of Japan’s lost decade where they also had interest rates stuck at the ELB began a process of rethinking. By the time the GFC came around many macroeconomists had realised that there was an Achilles Heel in the Consensus Assignment. Fiscal stabilisation was still required when interest rates hit their ELB. That is why we had fiscal stimulus in 2009. The importance of this cannot be overstated. The policy consensus in 2009 was that fiscal stimulus was required, because monetary policy was not enough. This consensus didn’t evaporate in 2010. What overrode it was mainly politics - what I call deficit deceit. There was also a bit of panic in some quarters caused by the Eurozone crisis. However a majority of academic macroeconomists continued to believe that further fiscal stimulus was required, and that majority got steadily larger as time went on. Which means that the Consensus Assignment that Martin talks about is dead, or at least dead until monetary policy makers can agree some form of fiscal delegation (e.g. helicopter money) with governments. As this paper from the Boston Fed points out, downturns where interest rates hit their ELB are likely to become the new normal, but policymakers have not adjusted to this. (The exception is Labour’s fiscal credibility rule.) Quite simply, most policymakers have not learnt a major lesson of the Global Financial Crisis. Most experts who follow the Brexit negotiations think the Withdrawal Agreement (WA) will sketch in pretty loose terms what the final relationship between the UK and EU will be, although some EU politicians have indicated a reluctance to do this..A vague WA has been called a ‘Blind Brexit’ (ht Chris Grey). While a blind Brexit might help in May’s efforts to achieve an agreement and (maybe) to get parliamentary approval for it, it remains a very undemocratic way forward . Here is why. Suppose there are only two types of Brexit possible: a No “not the end of the world” Deal or BINO (staying in the single market and customs union). All the polls suggest No Deal is not the will of the people, and its support is in any case dependent on a false view of its economic consequences. Equally it is difficult to understand why anyone would support BINO compared to EU membership, as the only major difference is that we no longer get a say on how the rules we have to obey are changed. A result of keeping the WA vague about the final relationship is that this binary choice is not apparent to many voters. In particular the UK government is still peddling various halfway houses that the EU is very unlikely to agree to, but we will not know for sure that they will be rejected until after the WA. If we did know it before the WA the number of people who had changed their mind would be greater than it is now, which in turn might embolden parliament to call the whole thing off. Thus we will leave under false pretenses, of exactly the kind that led to the narrow vote to Leave in the first place. When it does become clear that there are only these two choices, it will be too late to change our mind without new costs. Re-entry into the EU might require becoming part of the Eurozone for example. So we will could end up with BINO plus face saving details forever, and pretty well everyone (including No Deal advocates) will agree we are worse off than we were before. A similar problem happens if parliament does not approve the WA and we end up with a second referendum. The logic of a second referendum is clear. In the first in 2016 the promises made about what leaving would mean were various and many were untrue. Now we know what leaving does involve it makes sense to ask the people once again. Except in any referendum held after the WA fails to be approved, we will not know what the final deal will be, and that will give May the chance to spin her deal in any way that gets votes. Rather than a referendum on a final deal, it will in fact be a second referendum with unicorns only slightly less outlandish than in the first referendum. This is what I mean by a very undemocratic procedure. The fault lies first with David Cameron, who should never have agreed to a referendum where the type of Brexit was unspecified. It then lies with May, who initially prefered Brexit fantasy to reality and despite Chequers still panders to the Brexiters. Above all it is the fault of the Brexiters, who by going back on an agreement made in December wasted precious time so they had more chance of getting No Deal. The EU cannot really be blamed for going along with a vague WA. They are quite happy with BINO, and it avoids a No Deal accident. For that reason they may feel it makes sense to help May. The alternative of insisting on a detailed WA on future trade is high stakes: it could end Brexit, but could lead to No Deal. It is not surprising that most EU politicians would take the less risky option. It remains the case, nevertheless, that by allowing May to have a vague WA on trade they are assisting in the deception of UK voters and MPs, who will be leaving the EU without knowing what is going to take its place. I hope that is something the EU recognises if we do leave in March 2019 and subsequently want to return. I suspect, however, that this is a vain hope. It is also costly in economic terms, because it prolongs uncertainty about what future trade relationships will be. Some of the issues I describe here may also divide those who voted Remain over whether the WA should be passed in parliament or not. During the process of selecting the blogs I needed to tell these stories, I came across one I had forgotten completely. It was called “Do we get the leaders our media deserves?”, and it asked why many of the successful (in terms of popularity) leaders of today are of the likes of Johnson, Farage and Berlusconi, while leaders with far more integrity and honesty like Ed Miliband appear unpopular. The post was written at the end of 2014, and a postscript for the book notes that Trump versus Clinton was in part a devastating example of this trend. It is tempting to respond by saying this is just what voters want: politicians that make them feel good. There may be an element of that, but what has nothing to do with voters is how the Johnson type politicians get a easy ride from the media. When he deliberately stokes islamophobia, the criticism is disarmed with a cup of tea for waiting reporters. I have yet to see an interview with Farage where he is questioned about his support for far right parties in Europe and his Russian links. This interview with Johnson by Eddie Mair stands out in talking about past sins because it is so unusual. Most of the time the media seems content to reflect his easy charm. While people like Farage or Johnson are normally treated with kid gloves, others get a much harder ride. The left tried it with Cameron and Osborne: posh Eton and Bullingdon club boys who were clearly out of touch with ordinary voters. Sometimes these attacks work, and sometimes they do not. No doubt the reasons why are complex, but it seems to me that two things matter a lot. The first is whether or not the person being attacked has the personality to deflect such criticism, and the second reflects the extent that attacks become part of the non-partisan media’s agenda. Here is a time series of how Corbyn’s leader ratings have been getting steadily worse over the last year, and by far more than those of his party. This could be for many reasons. It could reflect disillusionment by Remain inclined Labour voters as events have shown Labour’s pro-Brexit position is not just opportunistic triangulation. It could reflect a lack of initiatives coming from the leadership (although it does not help that when he does make speeches they are blatantly misinterpreted). It could be that Labour’s problems with antisemitism are constantly in the news: although these stories do not have high impact among voters, for those that do notice they are seen as a negative for Corbyn. I have argued before that the Labour surge before the 2017 election and the subsequent decline are part of the same phenomenon: the ability of the media rather than the politician to control the agenda outside of election periods. The MSM is clearly much more hostile to Corbyn than any other major political figure today, and the row over antisemitism shows that clearly. Because this debate has become so partisan, I have to say the following. First, I am no Corbynite (read my posts during the Corbyn vs Smith campaign). I also think antisemitism within the Labour party is a real problem, and that large parts of the membership seem to be in denial about this. Not adopting all the IHRA examples (but with accompanying text to clarify meaning drafted in consultation with Jewish groups where possible) was a big political mistake. It created concerns in the Jewish community that the media was right to reflect. The idea that the non-partisan media’s reporting of this is just a smear campaign is nonsense. All those things can be true, but it can also be true that the broadcast media has given the issue excessive prominence. How do I know this? The obvious comparison is with Islamophobia in the Conservative party. This has been given much less coverage, but I would argue that problem is at least as bad. As far as I know, Labour has never run a clearly antisemitic campaign for a major political post, but the Tory party have run an Islamophobic campaign in which the Tory leader played a major part. Some say the difference is because Corbyn himself has been described as antisemitic, but the betting odds for next Prime Minister for Johnson and Corbyn are similar. To say that broadcasters cannot help reporting what is going on is very naive about how the media selects what is newsworthy and what is not. Many would argue this bias is because Corbyn has few friends in the media, and that may be a part of it , but I prefer more structural explanations. For the broadcast media balance seems to involve MPs in Westminster rather than their own viewers. Labour MPs are prepared to criticise the leadership in public while Tory MPs are not, and this means one story gets much more airtime than the other. We can see this clearly with Brexit: because the two main parties went with the 52%, the point of view of the 48% (now more) who oppose Brexit was largely ignored by the media. Exactly the same can now be said about the Muslim community. A good test of all this is to reverse roles. Suppose Jeremy Corbyn had written an article in which he had made fun of how orthodox Jews dress, and all the party had asked him to do is apologise but he had refused. Suppose the Labour party had no code at all covering antisemitism. Would the broadcast media have been happy to show pictures of him offering vegetables from his allotment to reporters and then forgotten about the whole thing? I’m sure natural charm has something to do with why some political leaders are treated differently than others, but I think that is only a small part of the story. It may explain, for example, the lack critical reporting. Most of the time it is presumed that Labour did not adopt all the IHRA examples because of antisemitism. Until recently the Israel/Palestine conflict was hardly mentioned, and neither was the fact that a select committee had suggested the IHRA examples were unsatisfactory on their own. Ludicrous statements about existential threats or rivers of blood go unchallenged. In some quarters it is deemed insensitive to question motives (Stephen Pollard, Jewish Chronicle editor, has said: “The left, in any recognisable form, is now the enemy”). In contrast a Conservative minister is happy to dismiss claims of Islamophobia by attacking a group that made the claim as unrepresentative, and no one in the media notes the Conservative Muslim Forum has made similar complaints. Whatever else this is, it is not good for democracy. Because Conservative MPs keep quiet about Islamophobia in their party, the issue only appears occasionally in the media. As a result, nothing is done about the problem. In contrast Labour are trying to do something about antisemitism, and their reward is constant attack. The final report of the IPPR’s Commission on Economic Justice is released today, with the full title of Prosperity and Justice: A Plan for a New Economy. I was lucky enough to get an advance copy, and it is a very impressive document: very well researched and well argued. It is nothing less than a blueprint for a new progressive government. Of course there are some proposals I have doubts about, but it is sufficiently authoritative that in future anyone should ask of any progressive economic programme how does it relate to the recommendations of this report. As far as my own area of monetary and fiscal policy is concerned, I’m not sure I have seen in one place as clear and comprehensive a summary of the lessons of the recent past and a better set of proposals for the future. I wrote about an early draft of this chapter in April, so I will be brief here. Their proposed fiscal rule separates current and investment spending, but suggests the ONS and OBR look to obtain a measure of spending that helps future generations that is better than the national accounts definition of public investment. They suggest a substantial increase in public investment, while current spending in constrained by a rolling five year target for balance. However they suggest that if interest rates are stuck at their lower bound, the focus of fiscal policy (current spending and taxes as well as investment) should be stimulus. Readers familiar with this blog will know this is very similar to the proposals in Portes and Wren-Lewis, 2015 and the Labour Party’s fiscal credibility rule. For monetary policy they suggest ending the primacy of inflation, and adding underemployment and nominal income as primary targets. In addition, they suggest that QE involve creating money directly to expand the activities of a National Investment Bank (NIB) when a large macroeconomic stimulus is required. Note that, unlike a fleeting proposal by Corbyn, money creation to expand the NIB remains a call made by the independent Bank of England in a recession rather than by the NIB itself or anyone else. I would go further on the Bank’s mandate, but otherwise the IPPR’s proposals look eminently sensible. The chapter on industrial policy seems sensible, with some ideas from Mazzucato (e.g. public sector led missions) clearly evident. Beside the NIB already mentioned, there is an emphasis on direct support rather than via the tax system (e.g. patent box) which often have large deadweight losses. They argue an industrial strategy should not just be about helping and adding to innovation clusters based around universities, but also in increasing productivity in what they call the ‘everyday economy’. In my view it is higher productivity and not greater union bargaining power that will raise real wages in a sustainable way, although in other areas a greater union presence can be helpful (see below). For many one of the most interesting ideas - of course not new - is to end the shareholder model, and replace it with a stakeholders model where workers have an influence on the board and executive pay. It represents a move from a US to a more European model. While I find this argument fairly convincing, the idea under reforming the financial system that the Financial Policy Committee (FPC) of the Bank should target house price inflation is misconceived. What the economy needs is falling house prices, and once you make house prices a target the pressure will be to stop that happening. The idea of a citizen’s (social) wealth fund is interesting, but I’m not sure a strong case for it is made here. Why should a government hold assets and issue debt, for example? If you want to redistribute wealth from the wealthy old to the poorer young, why not do so directly? On tax the proposal to combine income tax and national insurance seems sensible, as is the idea of a replacing bands with a formula based system (as in Germany). The same goes for a lifetime gifts tax to replace inheritance tax, and a land value tax. There is so much else in the report, but let me end by talking about one issue: executive pay. There is a cute chart in the report that I reproduce below. The report starts, quite rightly in my view, by emphasising the dangers of inequality. It also suggests that this cannot just be tackled ‘after the fact’ i.e. by tax and welfare measures. But will the stakeholder measures talked about above, or greater union influence, be enough to reverse runaway corporate pay? The rise of the share of the 1% starts with the advent of a neoliberal US and UK, and it has made the rest of us noticeably poorer. The report involves reversing many aspects of neoliberalism, but an interesting question is whether that is enough to achieve a decline in the 1% share, or whether other measures like higher top taxes are an essential part of doing that? It is a fascinating report for anyone interested in a progressive economic policy. Do read it. This is a personal nostalgic footnote, which I am only writing because I could not easily see this information online. New Economy also happened to be the title of the IPPR’s journal in the early 1990s, which is now called Progressive Review. I remember it well because between 1993 and 1995/6 I wrote a number of articles for it based around simulations of the macroeconometric model I had developed with Julia Darby and John Ireland. The idea to do that came from IPPR’s Economic Director Dan Corry, with Gerry Holtham as overall Director at the time. Apart from members of the modelling team, Rebecca Driver helped write a number of the articles. The first article over that period had the title “What’s so Bad about Borrowing?” (plus ça change), and the last “Avoiding Fiscal Fudge” which proposed an independent fiscal institution or fiscal council for the UK. That took 14 years to come to fruition, and I hope many of the proposals in this report do not have to wait so long. I realise I have not written much about Greece since the open letter to Angela Merkel that Thomas Piketty, Jeffrey Sachs, Dani Rodrik, Heiner Flassbeck and I wrote in July 2015 (see here and here). Nothing has changed to alter the views I expressed then. The excess borrowing, some of which they kept secret, of Greek governments before the crisis was always going to involve painful adjustments subsequently. Eurozone governments and the Troika (Commission, ECB and IMF) turned a painful adjustment into a major calamity. Unfortunately for a UK audience I have to stress this has nothing to do with the EU, and everything to do with the Eurozone and what I called in one post the “stupid cruelty of the creditor”. Private banks were happy to lend to the Greek government because they mistakenly believed their money was as safe as if they were lending to Germany. Other governments first delayed and then limited Greek default because they were worried about the financial health of their own banks. They replaced privately held Greek debt with money the Greek government owed to other Eurozone governments. From that point voters would always want all their money back. In an effort to achieve that the Troika demanded and largely achieved draconian austerity and a vast array of reforms. By July 2015 the Greek government was able to pay for its spending with taxes, so all it needed was loans rolled over. The Troika would only do that if the Greek government started running a large surplus to start paying back the debt i.e. further austerity. It made much more sense to let the economy recover first, but the Troika did not see sense. They got their way only because the ECB cut off the supply of Euros to Greece. The only way out for Greece was to leave the EU and its people did not want this. Outside the Eurozone a government in a similar situation would have defaulted in 2010 and its creditors would have lost their money, or it would have defaulted once it got to primary surplus. Being in the Eurozone with the ECB doing the creditors bidding was a different story. in far greater numbers than elsewhere in Europe and in Greece before the crisis. Most of this is the result of the stupid cruelty of the creditor: the Eurozone governments, the ECB and the IMF. I compared the indifference of other Eurozone countries to the suffering they imposed on Greece to the inaction of the English government during the Irish famine. But the major lesson I draw from all this is that intergovernmental loans within the Eurozone are a very bad idea, because they just encourage creditors to be stupid. Outside the Eurozone, once a debtor economy has achieved primary surplus it can default on its debts and that gives it some power over creditors. That helps prevent disasters like Greece happening elsewhere. Inside the Eurozone the creditors have too much power, because they can threaten to cut off money to a member's banking system or throw you out of the club. The Eurozone has not learnt this lesson for obvious political reasons, which makes it a dangerous club to join. If you are unfortunate to live under a Eurozone government that secretly borrows too much, many more of your countrymen will die as a result of being in the Eurozone.